Ernemann Werke AG. The viewfinder is complete apart from a closing spring missing from one flap. There is no evidence of the German label having been removed. 9 by 12 cm. 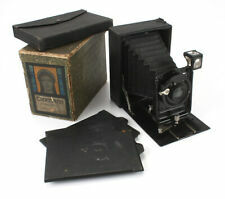 There is an intact ground glass screen, with folding cover in good condition. Doppel Anastigmat is in clear and clean condition. Leather strap in good order, half box in nice condition too. Sevendale House. Tripod bushes on both base and side. Electronic - 10. Optical - 9.5. Ernemann Heag 0. Wooden board fitted to back, no ground glass back or plateholders included. Ernemann Plate Holder Wallet. Rear Ground Glass & Viewer - Excellent & unbroken. Shutter - Checked & working, noting, occasionally rear shutter blades sticks. Altersgerechter guter Zustand mit normalen Gebrauchsspuren, technisch einwandfrei. The body is generally excellent, with only a few small signs of wear. The shutter has been tested and is in full working order. The bellows are very good. Opening Plate Back, as fitted. Original Leather Case, with affixed Hand Strap. Altersgerechter Zustand mit normalen Gebrauchsspuren, Mattscheibe fehlt, technisch einwandfrei. Rollfilm 6 x 6 ~ Roll film 6x6. Film K 6x6. Foto und Optik. Objektiv Filter. Technik / Optik Varia. 732117, ins Holz innen eingraviert die 37. Defekt, für Werkstatt oder Teile. Schmuck Uhren Luxus-Accessoires. Schmuck / Uhren hochwertiger 2nd-hand Schmuck / Uhren und Lifestyle Produkte. Ernemann Dresden 1917-1920 Bob 0 double lens series A 186770. Verschlusszeiten sind ungeprüft. Verschluss löst aus. Verkauf wie abgebildet. Shutter speeds are not testet. Lens - Good, noting very light 'web' type fungus marks to one side. Internal - Excellent & clean. Finders - Relatively clear. Original Shutter Release Cable - Has light fray but just about works. Single Pleat Bellows - Good & extends correctly. Very rare box, Ernemann "Industria Alemana", film size 6x9. ERNEMANN BOX " INDUSTRIA ALEMANA" 6x9. ERNEMANn BOX " INDUSTRIA ALEMANA". ERNEMAN BOX " INDUSTRIA ALEMANA". Defekt, für Werkstatt oder Teile. ITEM: This is a very rare find from the estate. From a website it appears to be a Model 1. The lens reads Ernemann-Dresden Ernotar 1:4,5 f=16,5cm nr107160. I'm unfamiliar with how this works or if anything is missing. 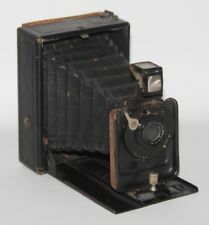 Bellows, viewfinder, and interior paint are in very good condition for its age (1926). A rare, collectible item in very good condition. ERNEMANN CRONOS C DRESDEN SHUTTER. CARL ZEISS JENA TESSAR 1:4,5 f=15cm LENS. MODEL: VII. BELLOWS FOLD IN AND OUT SMOOTHLY. SHOULD CLEAN UP NICELY. NO FURTHER TESTING HAS BEEN DONE. UNKNOWN WORKING CONDITION AS I AM NOT AN EXPERT IN THIS FIELD. Made in Dresden, circa 1917-1922. Made H. Ernemann. All leather in good condition. Shutter is working. Aperature appears to work. You are responsible for them, and we do not know how much they will be. 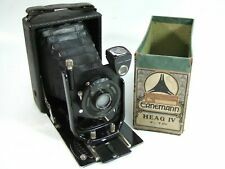 ERNEMANN HEAG I, 9X12CM, LAST VERSION, 135/6.8 DETEKTIV APLANAT, WITH GROUND GLASS BACK, WALLET WITH THREE UNMARKED PLATE HOLDERS IN WORN ORIGINAL BOX, WORKING, GLASS HAS INTERNAL HAZE AND FUNGUS, GROUND GLASS IS CRACKED, LOOKS EX/EX . You are responsible for them, and we do not know how much they will be. We want you to be happy. You are buying from a professional photographic dealer. You should expect everything to function reasonably well, and that all optics have no problems that would noticeably affect image quality, unless we describe them otherwise. In Clean Conditions and in Perfect Working Order. Glass/Optic : Clean. It has a focal-plane shutter to 1/1000. Good bellows, all working parts. See photos for all details including lens info. Will not separate. The shutter is runing T, B, up to 100. Precious original box and instruction manual are attached. It is perfect for collection. ＊Has not been test shooting with film loaded. You will get what you see in the pictures. On sale the depictedErnemann Detectiv Aplanat Heag XV with 1=6.8 and F=80mm Lens. Its operational condition is unknown and it has several signs of its age all around. I'll be happy to help. But still in very nice condition. Clean lens. No scratches, no cleaning marks, slight haze, no fungus. 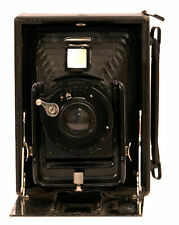 Ground glass in good condition. Aperture and shutter speeds setting smoothly. Shows wear on the aperture blades and are clean. Shutter is working perfectly and speed is pretty accurate. Original bellows is good, light leak free, is loose at the rear. Easy repair. No exceptions! Ernemann Dresden Camera Doppel-Ojektiv - approx. 100 years old working German! Watch all the photos and just than buy the item. The shutter is working! Serie: A461933. Room ERNEMANN ' Globus H ' mahogany and nickel-plated brass made in Görlitz, in Germany, by Herbst & Firl and distributed by his partner Heinrich Ernemann. Toggle front body and back. Three double chassis. Shows no cracks. Shutter works perfectly on both settings. Lens in good condition. Strap in good condition. Beautiful for display. Size 21X10.5X16CM. Bellows in good condition. Probably light leak free. Shutter is working Aperture works and blades in good condition. Ernar f6.3/80mm lens. Shutter speeds to 1/2500th of a second. Zone focusing. Self-casing front door. Body shows signs of wear in the form of paint loss. Leather skin in good condition. I cannot get the back off and don't want to force it. The lens is a Carl Zeiss Jena Tessar f4.5 15cm lens in a Ernemann shutter. The glass needs a cleaning. The back is missing its glass. The leather shows wear. It probably has other issues. Sold "as-is".